You can enjoy amazing Chinese food at home with this Baked Sweet and Sour Chicken with Fried rice recipe! This is one delicious dinner! I have a DELICIOUS recipe for you all! I am so excited to share this one. My family and I LOVE this dish! It has such a great flavor. You could probably trick your family into thinking you picked up some yummy Chinese food at a gourmet restaurant… It is that good, I promise! Delicious sweet and sour chicken baked in the oven. This recipe beats any take-out Chinese! Start by preheating your oven to 325° degrees. Rinse your chicken breasts in water and then cut into cubes. Season with salt and pepper to taste. Dip chicken into the cornstarch to coat, then dip into the eggs. Heat ¼ cup oil in a large skillet and pan-fry chicken pieces just until slightly browned but not cooked through. Place chicken in a 9×13-inch greased baking dish. Mix all of your sweet and sour sauce ingredients in a bowl with a whisk. Pour evenly over the chicken. Bake chicken for one hour, uncovered. During the baking process you will need to turn the chicken every 15 minutes. Serve this delicious chicken with the fried rice recipe below! 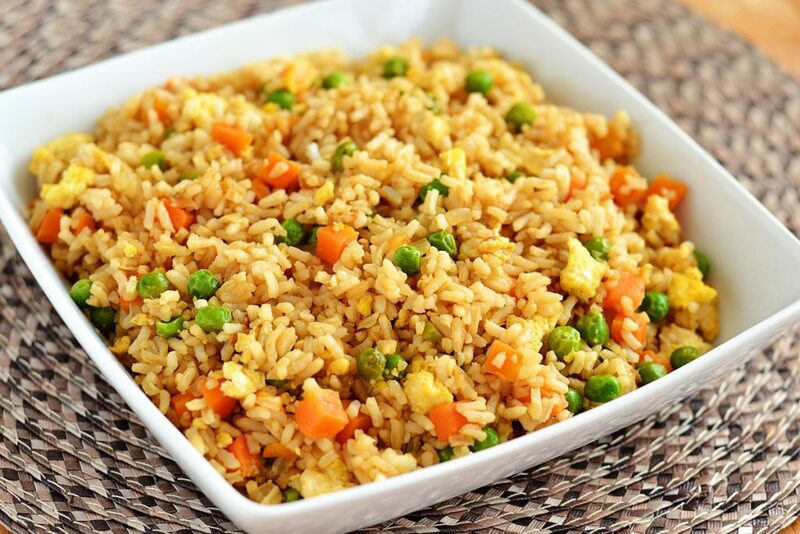 Fried Rice that is super easy to make and delicious! Lower the heat to medium low and push the mixture off to one side, then pour eggs on the other side of skillet. Stir fry until scrambled. Now add the rice and soy sauce and blend all together well. Stir fry until thoroughly heated! Wow Holly! This looks AMAZING! I will be trying this one out soon! Dang, this looks just like the stuff at chinese resturaunts! Michael and Colby would love it!!! Holly welcome to the food blogging world! 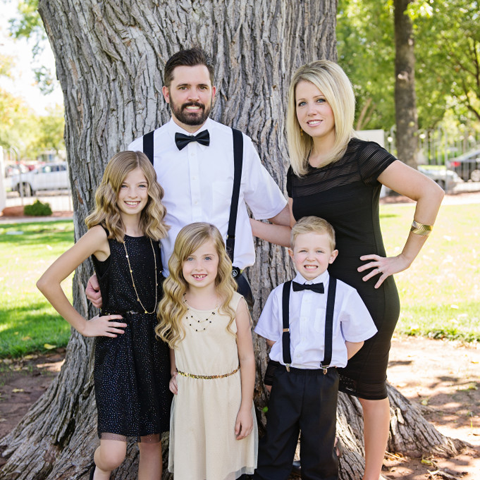 What a cute family you have! Your recipes look stellar too! Can’t wait to see what else you share! Aww thanks so much Emily 🙂 Glad you stopped by! Definately making this! I love chinese food! Thanks, Holly! I just want to let you know that I am not that great of a cook and was so sick of my husband criticizing everything I made. I almost gave up cooking until my sister-in-law, Codi, told me about your blog. I have tried a few recipes and every one of them has been delicious. I made this sweet and sour chicken and my husband absolutely loved it and the fried rice was amazing too. He like things to be a little spicy so next time I will try the szechaun chicken. I can’t wait. Thank you so much for making me feel like I really can cook. I can really relate. Please share any tips or recipes. I make this chicken every few weeks and it’s always a hit. Mel knocked it out of the park with this one! WOW! I made the chicken and it was amazing! The sauce was just perfect. My husband loved it and we will definitely be making this one often! Thanks! Ok this might be a really stupid question, but here goes… when you say turn the chicken every 15 minutes do you mean flip each piece of chicken, or just rotate the pan. lol I did both because I didn’t know. Again I know stupid question but that’s just how I roll haha. This was simply amazing….SOOOOO good!! I added the ham to the fried rice (my first time to make that!) and I love the whole combination. Better than eating out! Thanks for the wonderful recipes! I made this this past weekend. LOVED it! I couldn’t believe how easy the chicken was to make. The fried was a little tough. It was too dry & plain. I added a few extras into it & helped a little. Just no camparison to my fav chinese restaurant. BUt we still LOVED it. Going to make again! This was absolutely amazing and delicious. Everyone in the family loved it and my husband RAVED!!!! He said it was the best sweet and sour chicken he had ever had and couldn’t believe the fried rice was homemade!! Thanks so much!!! My kids loved it! Thanks for sharing, it was excellent! This does look great. It is still pan fried before it’s baked, but I guess that is better than deep fat frying. I will give it a try on a day I have plenty of time to bake that long. Found this on pinterest and tried it tonight. It was delicious! Thanks for the great recipe! What do you do when the fried rice gets all mushy and clumps together? I used the biggest pan I have, but the grains of rice just didn’t seem to separate. Is it the pan, the rice cooker, or did I mess up somewhere? Anonymous – your using already cooked rice, right? I don’t know how it would get mushy, unless you didn’t scramble/cook the egg well enough before you mixed it into the rice. Or maybe you used to much soy sauce. Those are the only ways I can think of how it would’ve been ‘mushy’. Yum! I just made a batch of the fried rice (we made the chicken last week), and it’s just perfect. Both were! So nice to be able to make some of our favorites without paying an arm and a leg for take-out. Thanks! Found this on pinterest and tried it last night. It was delicious! My two grandsons just Rave about it. I used two bags of the “Boil-in-a-bag” white rice and it was perfect. Thanks for a great recipe. I’ll be making this for a long time now. This was so good. I just made this tonight for the second time in a few weeks and I made a double batch just so we could have leftovers. I made my rice first thing, rinsed it in cold water, and threw it in the fridge while I cooked the rest of the meal. It was nice and chilled by the time I needed it. Great recipe! Just finished eating this. It was delicious!!!! However, a tad too much vinegar. I think next time I will decrease the vinegar and sugar, and replace it with pineapple in juice. That way it still has enough liquid, enough sweetness, and I LOVE pineapple!!!!! I made your fried rice with dinner tonight and it was AMAZING! Better than what we get at the restaurants and cheaper! I halved the recipe, b/c we are a small group and it turned out great. My husband, my 2 year old and I are now huge fans. Also, it was super easy to make! Making it right now, rice is wonderful, waiting for chicken to finish baking…stole a little piece and it was yummmmmmy!!!! Thanks so much for this recipe! It was amazing! We added hot sauce to the sweet/sour sauce and spiced it up a bit. Also, we like noodles better than rice so I substituted noodles and it was still amazing! Omgosh! I am such a Sweet and Sour Chicken snob. This was WONDERFUL. We served it over white right and doubled the sauce amount because I want to die early. 😛 As left overs tonight, I am reheating on the stove and made more sauce and stir fried up some onions, green and red bell pepper and through that in with some pine apple chucks. THANK YOU!!!! From a very happy camper! I thought the 1 C of corn starch seemed like a lot and I only used 1/2 C and it was plenty. I substituted bottled orange sauce for the sweet and sour and it was fab! I found that using premade and cooled rice worked much better! Thanks for the recipe! We scarfed it down! Found this recipe on Pinterest. It caught my eye because it was “Gluten Free”. Hubby cooked it tonight and it was fantastic. Eating this chicken now and it is amazing!! We just used regular rice as I didn’t realize I didn’t have any onions or more eggs. Will have to try the fried rice next time. I wasn’t sure what type of vinegar to use, but since so many of my chinese recipes use cider vinegar, I used that, and I used just a shake or two of garlic powder because I was out of garlic salt. Anyway, the meal is absolutely wonderful and we will put this as a regular on our menu. Love that it is baked! Thanks soooo much! Does anyone know of a substitute for the eggs to use for the chicken coating? made this tonight….very good….I baked my chicken at 400 for only 15 mins….I also added mushrooms, red pepper, green onion & cashews to the rice….delish…will make again! I made this tonight as part of the meal for my first foodie blog post. I loved it! Would it be ok for me to link back to this page so my followers can enjoy this recipe, too? Just tried this recipe, it was great, looking forward to trying more of your recipes in the very near future. thanks for posting these. Did you mean dip the chicken into the eggs THEN into the cornstarch, or the other way around? This looks great! My family just moved to S Africa and I haven’t been able to find cornstarch. Do you know of anything I could use in its place? Looks so yummy! But I’ll allergic to Corn. Do you think Potato starch would work instead? I made the chicken for dinner tonight and it was GREAT! I am now about to check out some of your other recipes. Thanks! I made this tonight, too. DELICIOUS. WIN. YAY! AMAZING!!!!! A little time consuming but oh so worth it. I doubled the recipe and it made a huge batch for dinner and lunch the next day. Since you are using corn starch, if you use the right soy sauce, the recipe is also Gluten free! That is a MUST in our house. We are going to have this tonight! Thanks for a new GF recipe that doesn’t have to be fried in a deep fryer! I tried this tonight, but with beef. It didn’t turn out good at all. Sorry. It was like rice with brown gravy, onion, garlic and egg. Only my husband could eat it. I was hoping for beef fried rice. I made this for dinner tonight! It was a big hit. Even my two-year old ate it. Thanks for sharing. i have been craving chinese fro 3 weeks but it always makes me feel so yucky! this was sooooo good and hit the spot! it was so incredibly easy to!! i might add another egg to the rice only because i really like egg! thanks for sharing!!! i HIGHLY recommend this! I just made this tonight. I was skeptical, worried the chicken would dry out in the oven so long. I was wrong! It was delicious, everyone in my family loved it. This is going into our “keeper” file of recipes and will be made again. Loved it. Accidentally put 1/4 cup of ketchup but I substituted the sugar for brown sugar and then a bit of white sugar. Added water chestnuts to chicken in oven. Very good! This was a huge hit with my family!!! I haven’t made the Fried rice and just serve it over regular rice. I also steam up some broccoli to toss in with the mixture so that it is more of a complete meal. My 15 yo daughter even made this meal last night…it’s that easy! It was wonderful coming home to a cooked meal!!! Loved this so much & it was easy to make! Much better than any Chinese takeout. I made some additions to the sweet & sour sauce by adding onions, green peppers & pineapple to make it more like the restaurant by us. Will definitely make this again…thanks for sharing!!! 1. If you pre-soak the chicken in baking soda for about 15 minutes, then rinse it well and pat it dry before starting, your chicken will have better flavor and texture, and be very tender. That’s a Chinese restaurant trick, and it works for pork, too. 2. Adding onions and peppers is necessary for me, it doesn’t seem like sweet & sour chicken without them. Pineapple chunks are okay, but I can live without them. 3. For the fried rice, if you replace the soy sauce with a 1:1:1 mixture of soy sauce, fish or oyster sauce, and Maggi seasoning sauce, you will get a much more authentic Chinese restaurant flavor. Otherwise, this is great, I love the idea of doing it in the oven. Good job. Another note re the rice – you must use older cooked rice, like make it the day before and refrigerate it or use leftover rice from a few days earlier. If you use fresh cooked rice, it will be too sticky and clump together. It needs time to dry out some in the fridge before you try to make fried rice with it. Also, if you store the rice in a zipper bag, it’s easier to break up for fried rice. I made this for our Valentine’s dinner. I added some shrimp at it was really, really good. Thanks! Made this last night with my boyfriend and it was amazing! We were hesitant about dipping the chicken in the cornstarch first and then the egg but we were pleasently surprised as to how the chicken got this nice crispy coating. By the end of the baking cycle, the sauce carmalized and thickened. We seasoned the chicken a tad bit more and also added cayenne pepper for kick. We added more salt to the sauce and a little less vinegar. And finally we only needed half a cup of cornstarch and one egg for the chicken. Everything else was spot on and we have leftovers for today. Thank you so much! We’ll definitely be making this again!! I made this tonight for dinner, it turned out AMAZING! This will definitely be in our “this is a keeper” recipe book! Thanks for sharing! Hey!! I bookmarked this so so long ago and finally made it in December, then I finally blogged about it lol. Made this last night for dinner. Let me tell you…AHmazing!!! My boyfriend extremely picky and only likes chicken and rice so I have begun finding plain chicken recipes…this is NO plain chicken. The flavor is unbelievble and it’s really easy to make :o) Next time I will add some red pepper flakes for a little kick but that’s because we love spicy so much!!! MAKE THIS CHICKEN! Do you think I can freeze the rice? It made a ton! made this tonight. i only had a small amount of corn starch so i used what i had plus corn flour to make a full cup. turned the oven up to 375 the last 15 minutes to crisp the chicken up a bit and it was perfect. the family LOVED this chicken and the rice. i used short grain brown rice that i had cooked and froze earlier in the week and low sodium tamari instead of soy sauce. Made this for dinner tonight after craving chinese food for two weeks. I had all the ingredints for the sweet and sour chicken and decided to try it out (found recipe from pinterest!). My husband and I are still drooling over the chicken – it was soo good! I’ll definitely be keeping this recipe and hope to double it next time. Thank you for such an awesome recipe! I made this tonight, and it was the best thing I have ever cooked. My husband walked in from work and said it smelled like a chinese resturant. I was so proud that I made a dish that tasted so good, all from scratch. Thanks so much! I have actually never left a comment on a blog before (haha), but I just HAD to post after I made this tonight. My 2 1/2 yr old daughter does not eat any type of meat… so frustrating. In yet another attempt to get her to try some chicken, I smeared this chicken on her lips & had her lick her lips. She liked it so much that she speared a piece of chicken herself & ate it!! And then kept eating ALL the chicken!! Yayy! Thank you so much for sharing! I stumbed upon this today on Pinterest and HAD to try it. I had all the ingredients, so it worked out perfectly. I subbed in 4 frozen chicken breasts and it still turned out great. I found that it had an abundance of oil (both for the chicken and for the rice), so I might reduce it by half next time and see how it turns out. I did sub olive oil for canola in the chicken recipe to make it a bit healthier, and it still tasted great. Overall, it was delicious, and now I’m going to fall into a food coma from eating so much of it lol. My husband requested that I made this once a week. No need to order chinese takeout ever again! I’m trying to calculate the nutritional info for this recipe and I was wondering how many servings this makes…thanks! Can’t wait to try it! Made this tonight and it was soooo yummy! I made this tonight and it was delicious. I just served it with steamed rice and everyone ate it up. Next time I think I will add some chopped veg, like bell peppers and onion, as one of the other comments has suggested. I wasn’t sure what vinegar to use, so I used pickling vinegar which was all I had. It was a bit too vinegary, but I tasted the sauce before I put it in the oven and added some honey and it was fine. Wonderful recipe. I followed the recipe exactly, and it turned out fantastically! Everyone in my family loved it. I’ll definitely be making this again. Made this for dinner. AWESOME!! Kids loved it, hubby loved it, I loved it. THANK YOU!!! I just made this tonight and it was soooo good! It was like getting take out. The only change I made was to add deli ham to the rice for a pork fried rice flavor. The chicken was delish. My husband and I loved it. I wouldn’t call it healthy but way healthier than take out and tastes just as good and you know exactly what’s in it. THanks so much for posting! Could you cook this in the crockpot instead of the oven? I made this and loved it. Next time I’ll set it up better (make an assembly line with the bowl of corn starch and the bowl of egg right next to the skillet. I am quite a messy cook!) My very picky son said it smelled good and ate it up! I don’t think this would work in the crock pot, since the sauce simmers down during the oven cooking process and the chicken needs to be spread out and turned every fifteen minutes. I’m afraid the crockpot would make a big chicken-lump mess. ADD BACON. Cook it before and then stir fry the onions and carrots into the grease, then the egg and rice… oh my gosh it’s the best thing.. like japanese hibachi rice! I made this 2 nights ago and it was delicious, I used regular distilled vinegar and I think I will try another kind (maybe apple cider?) next time. The fried rice was amazing! thanks for the wonderful recipe!! I came across this thanks to Pinterest. I will DEFINITELY try this out tomorrow! It looks so yummy! This looks amazing. I’m going to make it tonight. Should I use apple cider vinegar or white? Thanks, I will let you know how it turns out. Holly – I found your recipes through Pinterest and I have made 4 of them. They are AMAZING! We are trying this tonight and can’t wait!! Thanks for posting such wonderfully easy meals for busy moms and families!! They are delish! Another find on pinterest and this was the greatest asian dish I have ever made. My whole family ate it all up! Thanks for sharing this. Will definitely make again, and again. I cut back on the vinegar like some others but I think the whole amount would be fine and give more sauce. Can’t have enough sauce! Made this last night and boy, was it good! My husband, who doesn’t even really like Chinese food, had two helpings of it. He loved it. Thanks for sharing this recipe. It was wonderful and much better than what I could have bought at a restaurant. I have made this and it was delicious! I was wondering if it would work with other sauces as well? I found this on Pinterest and made the chicken tonight. (DH won’t eat rice, so I didn’t bother.) My 3 year old told me it was the best chicken he ever had. The recipe is already in our keeper file. Delish!! My only modification was to sprinkle a few dashes of instant chicken boullion to the fried rice… this was for mere personal taste only… It was delicious either way. :0) I am definitely adding this into my personal recipe rotation. Thanks for sharing! Made last night…delicious!! I was wondering though if everyone else’s turns out more soggy than crispy? I was hoping for more crispy but it wasn’t at all. The flipping every 15 min…is that just stirring it?? Thanks…it truly had an amazing flavor!! I’m one of those people who somehow finds a way to mess up recipes that have 5-star reviews and “best dish”-style comments… I was skeptical about this recipe, since many of the commenters said it was better than restaurant sweet and sour chicken. I made it tonight (the picture looked so good I just had to try it), and it was WONDERFUL! Didn’t do the rice (forgot to make it beforehand), but the chicken was truly delicious! As someone who is almost always disappointed with the effort:taste ratio of new recipes I try, I am thrilled to say I’ll be making this on a regular basis 🙂 Thank you so much for sharing this recipe! Just made this and it was delicious!! I used brown rice and it was so yummy! Thank you!! I have made this sweet and sour chicken recipe with the rice probably 6 times in the last 2 weeks. We love it! It couldn’t be much easier! In fact, I drove 80 miles round trip to get the supplies to make it for the 2nd night in a row! The first couple of times I made it I simmered my rice in chicken stock but couldn’t really tell the difference when I did just water the next times. I cooked my rice and made it – didn’t let it sit like other reviewers suggest. It has worked perfectly every time. RUSH to the store to buy the ingredients for this recipe – you won’t regret it! This was an awesome recipe!! And so easy! Thinking we may add thai chili peppers next time for more of a General Tso’s flavor? This will be in regular rotation at our house! – What temperature do you heat the oil to? – Do you put all of the chicken in the oil at the same time? – How long does it take (approximately) for the chicken to brown? * I tried this, but it took forever for my chicken to “brown” and then it was a tad too cooked before I put it in the oven! Just made this tonight for dinner-the rice and chicken! It was delicious and I don’t know if I’ll ever order Chinese again after making this! My picky dad who hates Chinese kept raving about how good the sauce was and called the leftovers for lunch tomorrow! Thanks for posting this-I’ll definitely be making again! I did double the sauce so there was plenty to go around! I made this tonight for dinner. My 6 year old said, “I don’t know how you did it, but this is awesome!” My husband had two plate fulls, which is rare. Thanks for sharing the recipe! The chicken was very good, we love to go eat chinese food but don’t very often because of the high amounts of sodium in it and this is a great way to get our chinese fix without feeling horrible with salt over load after. The only changes we are going to make is that we are not going to do the coating with the corn starch and eggs before. We are just going to cut into cubes cook a little then mix and bake. That way we are saving some calories we don’t really need. I made this tonight for my roommates! The three of us absolutely loved the chicken and the fried rice…. I will definitely be making this recipe again and passing it along to others! Thanks!! Made this tonight! And it was amazing!!! Made this tonight and everyone loved it and want me to make it again!! They said it was better than the take out. I had to agree. I’m quite fussy about my sweet n sour sauce but this one was perfect! I did tweak it a bit and added red and green pepper chunks,brocoli pieces,pineapple chunks and cherries. Def a keeper! I made this recipe twice this week: So good!! The first time I used your sweet and sour recipe the second time I made an orange sauce and did the chicken the same way. Both ways were loved!! Thanks for posting a great recipe! Sounds amazing, definitely going to try this! Thanks for sharing! made this tonite and it was great! my chicken was more moist than dry like it is in the restaurants…is that the way its suppose to come? i had it on 325 but at the end but it up to dry it out. it was so delicious though. love it & thanks! This recipe was so easy to make and tasted wonderful! My husband was very reluctant to try it at first. There were definitely no complains when I packed it for him for lunch the next day 🙂 Do you know how it will work if you use tomato paste instead of ketchup? Hi! What kind of vinegar did you use? This looks great! This stuff is AMAZINGGGGGG ! I am making this for a friend can I make it the day before or is it best to make it and eat it right away?? please answer soon as I need it for Wed April 25 Thank you so much.. Sorry forgot to say which recipe I was referring to. The fried rice..
made this chicken tonight and it was RIDICULOUSLY good!!! will definitely be in the regular rotation! thanks so much! I also made the fried rice. It was good as well but seem to be missing a little something. Not sure what…but would make again! Featured this recipe on my blog today! Holy Smokes! We tried this recipe tonight – EVERYONE loved it! I have a 3yr and 5 yr old, and a fussy husband, we all loved it. My daughter for the first time in her 5 yrs asked for more meat (I almost fainted) she is not a meat eater. It hit my craving for chinese to a “T”. Great job and wonderful site, thanks! My family and I LOVE this!! I made it last night for dinner and it was demended that I make it again for dinner tonight in a double batch. I served it over white rice. YUM! Thanks SO much! Got here from pinterest. This delivered on all of the billing! Made it tonight and it is a huge hit! Love it. Thank you! In the oven now for lunch…. this is my 4th time making it! It is absolutely wonderful! It is a regular lunch for me and my 2 & a half yr old. He eats it up! Such a yummy recipe! And the leftovers are just as good! I always make extra just to make sure we have leftovers! Made this last night and it turned out pretty good. Two mistakes I made (my fault) – (1) I added broccoli but I added it at the beginning of the hour – I should have steamed it and added it at the end. Will do that next time. (2) My chicken didn’t get a crispy coating… any suggestions on what happened with that? Maybe I didn’t coat my chicken well enough? I will definitely make this again! Need to add my thanks to the many before me for such a great recipe. My husband agreed that this was every bit as good as what we have eaten in Chinese restaurants. Thank you sooooo much for sharing it with all of us! You must love your recipes living on through the magic of Pinterest. 🙂 I tried the sweet and sour chicken tonight and it was delicious! Definitely a keeper. I was so proud that it looked just like your final photo too. Thank you for a great recipe. Made this last night and it was really yummy. I added green peppers to the chicken while it cooked and used green onion in place of the regular onion. And there’s next Sunday’s dinner – sorted! Thank you! The chicken was very good!! I didn’t change a thing in the recipe. I will be making it again. I made the rice as well and we weren’t that fond of it. It had too much soy sauce for our liking. I will give it another try soon and make some changes. I love your site..I have bookmarked several recipes to try! I made this about a month ago and it was so wonderful. I wanted to make it again tonight and couldn’t find my printed copy of the recipe. I have been searching for over a half hour and glad I finally found it again. it is so worth the effort. YUMMMM! Anonymous- sorry it didnt turn out for u. Based off the tons of times Ive made this ,and t also the 100+ comments ahead of yours… This is an amazing recipe. The problem is definitely not the sugar. Sorry. I love this recipe and use it ALL the time however to called it “Baked” is kinda silly since you’ve just fried the chicken. I whip this up in the same pan I’ve browned the chicken in and just add the sauce, it cooks down in minutes, no need to turn the oven on… It’s delicious and cuts out an hour of cooking time. Thank you so much for the recipe, it is a frequent go to in our kitchen! For all of the spicy lovers out there, I wanted to post a comment how I tweaked the sauce recipe to be more spicy! I did half ketchup half hot sauce and a few shakes of crushed red pepper flakes. I also sprinkled a little cayenne pepper on the chicken before frying it. I have made this recipe several times now, it is delicious! My husband always requests it. The only problem I have is that the sauce never gets very thick. Any suggestions as to how I can fix that? This was so great! I am just learning to cook and it was a crowd pleaser. Everyone loved it and it was pretty easy to make! I don’t have cornstarch at home and never really use it. Would using all-purpose or self rising flour work well? Or will it turn out too soggy? Looks great and I cant wait to try it! I made this for dinner tonight and it was wonderful!!! I just made this and it was fantastic!! !Kids LOVED it!! I made this one day last week and am making again tonight! Everything turned out better than I had any expectation!!! I used canned peas and carrots and it worked just fine!! Hubby said the rice was better than ANY he had ever eaten out anywhere!!!!! omygosh! OMG! This is wonderful! I just picked it up on pinterest and sad right down and made it. This is wonderful! Made this for dinner last night – it’s not really a week-night friendly dinner as it takes a bit of time to do the chicken from start to finish, but it was definitely worth it, the chicken was delicious!! I wasn’t as crazy about the rice, I think I need to tweak it a bit to make it to my liking, but I’ll definitely be making the chicken again, even my picky 4 year old loved it! I did this with tofu instead of chicken and it was amazing! The tofu was a little too sugary to my taste and the fried rice a little too sauce-soya-y but if you mix the two in your plate it all equals up. And next time I’ll follow the advice in the comments and cook everythin on the stovetop. This recipe definitely made it into my rotation! I made this tonight and it is AWESOME! Completely worth the effort, so good 🙂 I found this on Pinterest and so happy I pinned it! what is the nutritional info for this ?? and how much is one serving ?? Family loved this and it’s a keeper! Great blog! Thanks for posting the recipe, it really is as great as everyone says it is! I absolutely loved it! I just finished making the chicken…Oh My God!!! Just like they serve in restaurants! It turned out so GOOOOOD!!! This recipe is definitely a keeper!! Thank you so much! The sweet and sour sauce kinda tastes like McDonalds S&S sauce! Holy Moly! gonna make this again and again! my fiance loved the sweet and sour chicken. I can’t wait to make it again. Next time I am going to make the rice. I also dipped the chicken in the egg first cause the corn starch was not sticking and it can out great sill. have mercy this was DELICIOUS! First decent Chinese food we have had since moving South 4 years ago! And no MSG or other things we don’t like in it! We added a drained can of pineapple chunks, doubled the sauce and used white rice! Thank you from the bottom of our stomachs! For the mushy rice and clumpy rice people out there, try undercooking the rice a little so it is al dente. I use a little less water than the back of the rice instructions call for. Turns out great!! I made this tonight and was worried but I have to say it was AMAZING!!!!! I am soooo picky when it comes to Chinese food too but I LOVED this and even my picky 7 year old ate it. Thank you thank you thank you!! I will be trying the fried rice for sure! I hate to be a party popper, but there is no way that you can call this chicken “baked” after you fried it in 1/4 cup oil. That is the definition of “deep fat frying.” Just thought you should know. This was AMAZING!! I am the queen of messing up good recipes but even I could do it! My non-chicken eating son ate several helpings! And my husband said that it was better than any chinese restante he’s ever had. I used a very small amount of oil to brown the chicken, maybe a tablespoon and it still browned up perfectly! Can’t wait to make it again. Next time I will make extra sauce for the rice and maybe add some pineapple and green peppers to the extra sauce. YUM YUM YUM!! I finally got to trying this tonight. I cut my chicken pretty small so when I was pan frying it pretty much cooked the chicken. Because of that I made the sauce on the stove, and simmered it for awhile..then poured over and cooked in the oven for 15-20 min. Hubs said it was awesome, and he doesn’t even LIKE sweet n sour chicken! Then to the rice. I used the microwave white rice…let it sit in the bag without opening after it steamed for an HOUR. The one thing you have to watch is your heat on the sesame oil. I think the taste was a bit on the burnt side, but I had it on high for awhile when scrambling and think it overcooked a bit. Everyone else said it was “AWESOME”. I also used frozen carrot rounds that I cooked then diced..and frozen peas that I boiled before adding. I am featuring this recipe on my blog. It’s a great recipe and versitile too. Next time I’m going to reduce the ketchup, alittle too sweet for me..but overall this is a keeper for sure!! Oh my gosh, this is a fantastic recipe! It was easy to make, a fast meal to cook up, and super tasty! Thanks for a new great recipe! Made this for dinner tonight…yummy!!!! My hubby said I should come tell you this ts the best chinese takeout I’ve ever made. Had it for dinner last night and I’m making it again for lunch. It came together quickly, I had all the ingredients on hand, the kid and husband loved it, and it’s fairly healthy. For all that, I give it a 4 stars! My family and I tried this last night for dinner and it was wonderful! I was definitely unsure about the sweet and sour sauce recipe but it was SO GOOD! My 6 year old even gobbled it up! I will be adding 1-2 more eggs next time though, since my hubby and I kept picking big chunks out of each others rice and eating them! The only adjustment I made was I used 1/2 cup of cornstarch in a bowl to coat the chicken. I had to do it in batches but that’s okay because I had to brown the chicken in batches. I threw out maybe 2 TBS of cornstarch at the end of that step. Thank you again for such a great recipe! I made this last night for dinner and it was devine! Seriously better than take out. I used three chicken breasts(the big Costco ones), three eggs and about 1.5 cups of cornstarch. It only took 45 minutes in the oven. My husband had thirds! Next time we will double the recipe and make it on a cookie sheet to fit it all. So good! Thank you! Despite rave reviews I was rather disppointed with the chicken simply because it was not simple to make and made a huge mess in my chicken. I’m not sure where I went wrong but I had to fry the chicken in batches, it took at least 30 mins just to fry the chicken:( then I had to bake it on top of them and the sauce splattered in my oven:( Although it tasted good it was not worth the effort, sorry I really wanted to like this recipe just had to give my honest opinion. Just made this tonight and it was amazing!! So good. Finally a homemade chinese recipe that doesn’t make me want to order in MORE! Thank you so much! This was AMAZING! I shared it on fb! The chicken is delicious and doesn’t taste as “heavy” as in restraunts! Better than any I’ve ever ordered! Thanks! Amazing recipe! My best friend and I made this for dinner (we’re both 15) and it turned out perfectly! The sauce was perfectly balanced between sweet and sour (without the strong vinegar taste of most recipes!). I can’t wait to make this again!! My family and I LOVE this!! EVERYONE that has tasted it loves it!! THANK YOU! I made these tonight and they turned out perfect! Thank you so much! I made this a few weeks ago, and OMG it’s AMAZING!! Thanks for sharing!! We are having it again this week. Thanks for posting the fried rice recipe! I linked to it from my blog, cant wait to try it! Think this could work on pork as well? I appear to be making chicken eggs. Do I really have to dip these one by one in the egg? This was great. It ended up looking like it cam from a restaurant, only better and fresher. The directions are right on point. Thanks for sharing this! I tried the fried rice recipe today with some leftover rice, and it turned out fantastic! My family loved it. The only change I made was adding an extra egg. I’ll definitely make this again and try the baked sweet and sour chicken with it. I just wanted to tell you that my chicken is in the oven and I’m getting ready to start on the rice. But I just LOVE that you show that you are using all Great Value brand stuff except the Hienz and the Kikkoman! Same here. It just tickled me for some reason. So anyway, I also LOVE that you posted pictures of each stage because when I had that eggy cornstarchy chicken on a plate, I thought I’d messed something up so badly that I might as well throw it out!!! Thank God for you picture looking the same way! Can’t wait to eat this. I’m sure it’s going to be fabulous. I’m following you blog for sure! 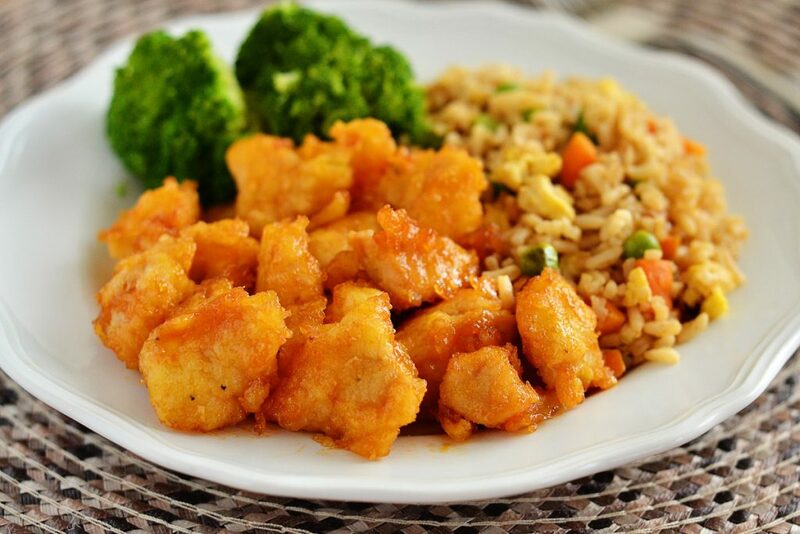 Sweet and sour chicken is always my dish when we have Chinese. Since I have found out I have Celiac 8 months ago I haven’t been able to indulge, but tonight I made this recipe and it was honestly the best sweet and sour chicken I have EVER had in my life! YUM! I want to thank you for this recipe. I found it on Pinterest and filed it away as easy enough for my 13 year old son to try making. We made it tonight and it was heaven on earth. My son was easily able to follow your steps and pictures (thank you for the great pictures) to make dinner mostly alone. I absolutely LOVE this recipe, thank you so much for sharing it! Everyone who has tasted it just loves it, even the leftovers are incredible. Best sweet & sour chicken recipe for sure! My chicken didn’t get nice and crispy in the sauce. I lined my pan because i’m lazy with dishes and i’m wondering if that’s why the sauce didn’t stick to the chicken as much. Any suggestions?? The recipe is still absolutely amazing!!!! Love this. Made it for the third or fourth time. I was able to find a less messy way to do the cornstarch. Just throw half of it in a baggie add the chicken and then top with the other half and shake shake shake. Really saves time and hassle. I am still using microwave rice (I like HEB brand) but used steamfresh by birdseye last time and didn’t let it sit and it wasn’t sticky or clumpy. I do usually whisk in some cornstarch w/ water to the sauce to thicken it up some before pouring over the chicken and tossing. Then I put it in the oven for 15 -20 min. This is a recipe that is a winner all round!!! Hi Holly, I just found your recipe through Weekend Potluck and I made it tonight. It was so good. We can’t have take-out anymore since my daughter was diagnosed with a peanut allergy. This definitely filled that hole. Thanks for the great recipe. I’ve pinned it and shared it with my FB followers. I found this on Pinterest, and I usually don’t bother taking the time to comment, but this is seriously THE BEST recipe EVER. My husband is picky, and I’m not the greatest cook, but he loves this stuff (and I do too!). Seriously, BEST EVER. Thank you! Made this last night and it was fantastic!! The whole family loved it. The only change I made was using apple cider vinegar and reducing the amount used. I will definitely make this again!! I also doubled the sauce which was perfect for 5 small chicken breasts. My kids ate it all up and wanted more. So good. Thanks for sharing your recipe! Super good !!! Make this it is soooo easy !! The best recipe I found for fried rice. Easy and delicious! Found your recipe on pinterest and have been saving it for a special occasion. Glad I did! My whole family LOVED it! I loved the egg/cornstarch combo for the coating. It made a nice crisp crust without being really greasy or having a heavy fried-chicken-y feeling that I find so off-putting in a lot of chinese restaurants. Thank you! Can I make this without the sauce? I love the chicken part at chinese restaurants but not the sauce. Will it still work? I found this by way of Pinterest, and let me just say that this sweet and sour chicken is one of the best things I’ve ever eaten! It was super easy! My husband said it was better than any Chinese food he’s ever had and he dreams of Chinese food day and night! I also asked my friend from China how he made it and this is a pretty spot on recipe, other than the baking part. He just does it all on the stove. Great recipe though, and I will definitely be making this again and again and again! Made this tonight and it was great! Absolutely delish! I despise sesame oil so I subbed olive oil and added extra garlic and soy sauce. I had fresh snow peas and carrots so I chopped those up and added them that way. Also added bean sprouts to the rice. So good! As for the chicken, spot on restaurant style! Even better! The Chinese restaurant by me isn’t the best and the chicken is always soooo fatty I’m so thrilled I found this! Maybe sub orange juice for the ketchup for an orange chicken! Yumm! Made this for the second time tonight. The first time we followed the recipe. It was really good but we let the chicken sit a little too long waiting for the rice so it was little soggy. Tonight I just fried the chicken until completely cooked then tossed with the sauce. It was unbelievable! We will make it regularly! The rice is wonderful too. Can’t wait to make this, How long would u say you cook the chicken in the skillet before putting it in the oven to bake? And how many people does this recipe serve as you have it listed? This is the BEST sweet and sour chicken I have ever eaten in my life! And I dont even like sweet and sour chicken. But THIS is fantastic!!! Thank you so much for posting this delicious and simple recipe. Im glad I came across it. 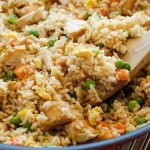 We made both the chicken and fried rice and it went over a million times better with my kids than I expected it too! They kept saying the whole time “Mom and Dad thank you so much for making this wonderful food!” We all agreed this is one to make again and again! Oh my, this was amazing. So yummy and I loved that you cooked it in the oven. It was still delicious the next day heated up in the microwave. Thank you so much. we have white vinegar or distilled malt vinegar…could I use either of those? Also what other alternative oil could you use if we don’t have canola oil? Hi Charley! I think just White Vinegar would be fine. Also, you could use vegetable oil instead of canola. Hope you enjoy the recipe! THANK YOU SO MUCH for this recipe!!! It’s a HIT at our table of 5 MEN!!!! and I was happy because it was relatively simple to make!!! Made this tonight was nervous because I was having company but it was awesome! I even bought lower sodium teriyaki sauce instead of soy sauce on accident! Next time I’m gonna look for a lower sodium option and buy the salt free ketchup just to lower the sodium I think it will still taste amazing!!! Put your recipe on the meal plan this month. Can’t wait to try it out. We LOVE this recipe!!! My 8 year old has decided it’s his new favorite meal! I’ve made it a few times now and tonight I am making it in my crock pot! My house just gets to hot with the oven on for that long! This was so good! I made this just an hour ago and my husband and children just loved it! Thank you for the excellent meal this will be going in our family cookbook! A great recipe– it was delicious! I found this on Pinterest! My husband and I made this last night and it turned out perfect! This recipe is super simple and easy! We will never order take out again! This is way better and totally worth the time! Thanks for sharing with us! I’m looking forward to reading through your blog! Made this tonight – definitely recommend it! Next time I might halve the recipe, it’s lot of food for two people. Also, the soy sauce was a little strong for me, but still very good. I am making this now. After I am done I will probably be sharing your link on my blog. I found this recipe through Pinterest. I made a few adjustments for me bc I can’t have soy and my husband is diabetic. Thank you! Hi this sounds really yummy. I am going to give this a try tomorrow. You say its 7pts, how much is 7pts, a Cup or a half a cup ? Oh my lanta, this is awesome! I made it for dinner tonight and my husband approved it for a weekly meal! Seriously hanks for sharing!!! Have not yet tried the chicken, but made the rice…… and loved it. Thanks for the recipe. I’ll be making it again for sure. This was a great supper and I cannot wait to make this again. My family loved it. Thanks so much for this. wow this was amazing. My 4 1/2 year old asked for seconds for the 1st time in his life!!! Thanks for the yummy recipe. I will be using it again. I love how simple this is. I’m in the process of making it now. Can’t wait to taste it! This recipe is amazing!! However, it was a little difficult for me to brown the chicken evenly when I fried all the pieces at one time. So, I had to redo, and brown one at a time, which was a little time consuming, but soooo worth it! 🙂 Thank you for the recipe!! I made this for dinner tonight and I have never had a better dish. We love this type food but I didn’t have a clue how to make it. I loved how the chicken browned in the sesame oil. I have tried a lot of recipes on Pentrest, but this is by far the best!!! Thank you so much for sharing it!! next time going to try it with cashews and some broccoli. Please keep sharing and I’ll be sharing the news!! This looks really good! Do you have any suggestions for substitutions for cornstarch? I can’t have corn but I really would love to make this. Thanks! Wow, this looks absolutely amazing!!! And easy!! Me and my family don’t eat red meat and I have been looking for great new chicken recipes and this is perfect!! Thanks!!! Do you have any idea how well if at all the chicken freezes? I do a freezer meal swap and this would be a fantastic addition. FYI the rice freezes really well (minus the egg I halved my amount last time and froze the un egged part) but we had no leftover chicken to test in the freezer, it was too good! I made this the other night. It was a lot of work. I think I started around 6:00pm and was eating at 8:30. Don’t get me wrong, that doesn’t bother me. I like to cook, and have a couple of cocktails while doing so! 🙂 It was also a little messy (maybe because of the cocktails LOL). However, that being said, I think this might be the best dish I have EVER made. IT WAS AMAZING!!!!! I made this not realizing my husband doesn’t like sweet and sour chicken. He LOVED it. He requested it for dinner less than a week later. Seriously, better than at a restaurant! This was soooo yummy!! Thank you for posting this!! Question: Do you think this would work in a crock pot? Your recipe for the sweet and sour chicken and fried rice stay in regular rotation at my house! Easy to make and they’re about as close to the stuff from a restaurant as you can get! Amazing. 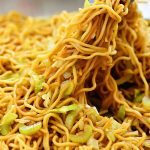 I have been looking for a homemade Chinese recipe that didn’t leave me wanting to order take-out. This is it. It’s delicious and so much healthier than take-out! Thank you so much for sharing! I tried this fried rice and it was just okay! It made have been because I didn’t have day old or leftover rice so I used rice I cooked a fews hours before and let cool. I will try again with day old rice and see what the outcome is. But I did expect more out of this rice. Our chinese restaurant has great fried rice so my expectations may have been too high. OMYGOODNESS….I’ve made this 3 times since I found the recipe. this stuff is like crack! It’s so addictive. The only change I made was to add cayenne pepper as I like things a little spicy. I am really allergic to MSG, which unfortunately limits the places I can eat. 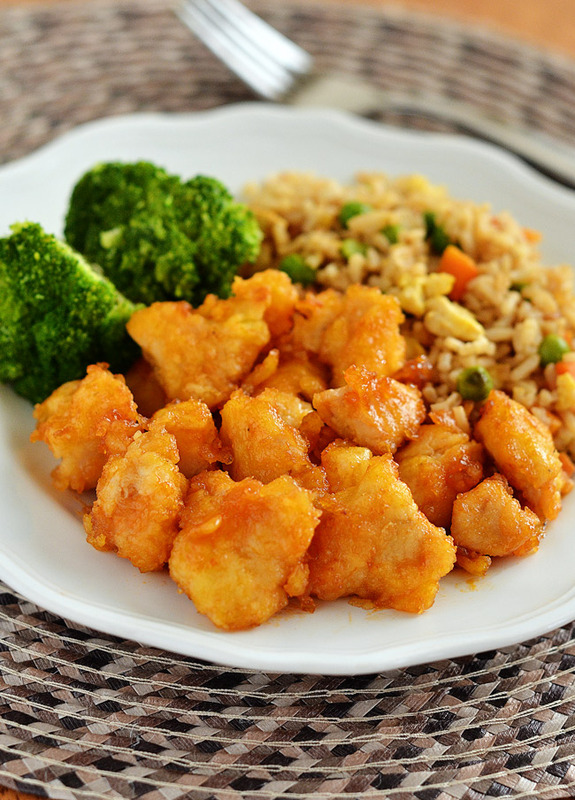 Last time I had a really bad reaction but I love sweet and sour chicken I am making this tonight I’m so excited. Thank you for the recipe! HI. I just wanted to let you know that I have made the sweet and sour chicken and the fried rice. Its all so delicious. Thanks so much for sharing. i have a lot of family coming for Thanksgiving and then again on Saturday. So saturday I am making the chicken and rice again. I know everyone will love it. Please stop by my blog when you get time. Thanks again. love it. Made the chicken for dinner tonight. Subbed half cider vinegar and half rice wine vinegar for the white distilled, and added some crushed red pepper flakes. Boyfriend LOVED it. I think maybe next time I’ll try cooking everything on the stove, or maybe just baking the chicken by itself for a while so it stays crispy! The sauce is awesome. Holly, thanks for the recipe. I made this for my family and they all loved it. I made my homemade Lumpia to go along with it…great pairing. Holly thank you for posting this recipe. I made it for my family tonight and it will be a part of our weeknight rotation. I made my homemade Lumpia to go with it…great pairing. Made the Sweet n Sour last night. Amazing stuff. I exchanged a few tablespoons of the vinegar with lemon juice and it turned out great. Also, instead of baking over the chicken, I just simmered it in the same dish I had sauteed the chicken in. Turned out spectacular. Thanks for the recipe! I’ll definitely have to give the rice a try! I decided to give this a go for dinner. Looks fabulous, but I cut the sugar in the sauce in half, waaay too sweet! Found this recipe on pintrest!! AMAZING, hubby said it was better than a restaurant! Thanks for the great recipe. Will make again and again!! Turned out amazing! I posted your recipe on my blog if you’d like to follow me. Thank you. This was amazing! So good that I’ve made it twice now (in 2 weeks)!! Holey moley!! Saw this post and had to try….tonight! It was so good my picky 2 and 9 year old boys both raved over it! Well done!! Oh my God! This was amazing. Everybody…19 year old son, husband and myself who has dairy and gluten allergy, loved it! You really need the time in the oven to soak up the sauce, so worth the wait! Thank you so much for sharing. Hubby already asked when we could have again…..I made it tonight! Found this recipe on Pinterest and can’t wait to try it! Just a heads up about the recipe directions, though. DO NOT rinse your chicken before use, it only spreads any bacteria that might be on the meat. I’ve never used/ had Basmati rice so I’m not sure how it will turn out. Let me know when you try it, though! I found this on Pinterest–just changed cornstarch to tapioca starch and used Ume Plum Vinegar. Thank you for posting this method! It is easier than frying the whole thing, and healthier. 4 thumbs up! (2 each from hubby and me) We loved everything about this, especially the fact that we know exactly what is in our food- unlike some Chinese takeout. Holly! You da bomb! I hate Asian food because it has always made me so sick but my husband loves it so I tried this one out and we devoured it! Scrumplishis! OMG! So beyond awesome! Kids could not stop saying wow this is awesome! Just made this for dinner and it was truly amazing. DH said it was the only time anyone has ever made Chinese food and it actually tasted like from a restaurant. Will be making this dish regularly, I’m sure. We substituted brown rice for the white, and used honey instead of white sugar for the sauce. So tasty! This is by far the best sweet and sour chicken I have ever had and by dar the best pinterest recipe I have tried. So, so good!! Thanks, Holly, this was delish! Wow, this recipe is awesome! Made it last night and was surprised it actually turned out as well as everyone here says (I’m not a cook and don’t pretend to be). Wonderful! Thanks so much! Made the Baked Sweet and Sour Chicken and the Fried Rice tonight and it was a HUGE HIT at our house! Thank you so much for this recipe! My sister sent me the link to this today. It looked so good I made it for dinner. AMAZING!!! Made this for dinner tonight and it was fantastic!!! Rice and chicken cooked perfectly! Thanks so much for sharing this with us! I don’t even know how I found this yesterday but I cooked it tonight an it was fantastic! Had to make changes for a diabetic hubby. Used baking Splenda instead of sugar, low sodium soy sauce and Egg Beaters. Didn’t have cornstarch so I just dusted the chicken with flour. It was so good and the chicken was very tender. It really looked just like your picture! Hubby wants me to make it with shrimp too. I make my fat-free fried rice once a week so I served it with that. Awesome dinner…thank you! Holly- I found this wonderful recipe recently through Pinterest. I made this last weekend and it was delightful. Such a great find! I shared this recently on my blog, linking back to you. I hope you don’t mind! This recipe is great! I added a little Thai chile sauce for some heat. Don’t think I’ll get take-out much anymore! This turned out perfect! I’ve never cooked Chinese at home but I will definately be making this regularly! It was a bit time consuming but im sure after i make it a couple more times ill know better what im doing & it’ll be faster! The only thing I did different was I added 1 tsp red pepper flakes to the chicken sauce & used brown & white sugar instead of just white! Oh & also, I baked it at 350 for 45 min & turned twice turning cooking! So, I tried this recipe tonight, and let me tell you… I am new at this cooking thing, and it was SO good! It is time consuming, but well worth it! I ended up having to use an extra egg to coat the chicken in, and didn’t use all of the cornstarch. It turned out perfectly! I made a double batch of the sauce, just because we had a bunch of chicken..my crust was also soft but didn’t bother us. It tasted fantastic. I also HIGHLY recommend adding some bell peppers. Gives it a ton more flavor. I also tried the fried rice. It was also so good! And way easy! I made the rice when I got home around 5:30, put it in the fridge with no lid to cool and then used it at around 8 and it worked perfectly. No clumping. I added an extra egg though! My boyfriend doesn’t really care for Chinese foos, but ate a ton of it, and said it was better then the restaurants! Highly recommend!!! I spotted this on Pinterest recently and tried it out. I cannot begin to tell you how wonderful it was. This is DELICIOUS!! I agree with some of the other comments, the sauce could do with a bit less sugar, but otherwise this is just perfect! I’ll definitely be making it again, with some extra sauce to mix in my white rice! Thanks so much for the recipe! Found this recipe on another blog a few months backand it is a huge hit in our house! The recipe I have calls for pineapple chunks in the sauce and we really like that addition. Someone asked if there is a substitute to cornstarch and I actually made this once with something called Wondra because I didnt realize I was out of cornstarch and it came out perfectly! Your fried rice looks so restaurant-like, bravo! And I can’t wait to try this recipe! The pics are great step by steps! Hello!I really want to make this for my boyfriends birthday, but I’m a little worried about using vinegar. Do you really used simple distiled vinegar? Not a rice vinegar or something? Please, reply!!! @ Beauty Nerd, Yes, just the distilled white vinegar. 🙂 Hope he loves it! I made this last night and my husband and I loved it. It was way better than eating out, and cheaper too. This will become a favorite for sure! Thanks for the recipe. Found a link to your website on Pinterest and made this for dinner tonight. My husband usually doesn’t like chinese good (but I do!) and he actually finished all of his chicken. I, of course, loved it. Thank you for sharing! I found your sweet & sour chicken recipe on Pinterest and it has quickly become one of my favorite go-to recipes! I have made it a handful of times, and each time I seem to love it all the more. 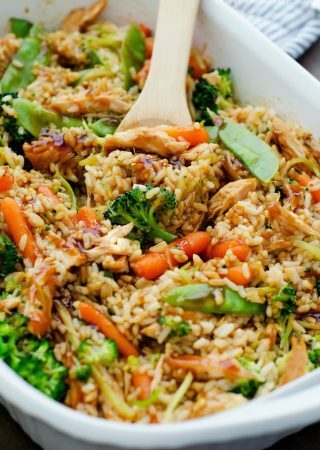 I usually just serve it over plain brown rice, the sauce from the chicken mixes with the rice and you get to really enjoy the flavor. I love this chicken, thank you so much for sharing the recipe, this is definately a keeper! Ok, at 46 years old, I am just becoming interested in cooking. THIS is THE best thing I’ve ever made. It was a huge hit with everyone in the family and the recipe was easy enough for me to follow and not screw up. Making the chicken now, smells amazing! (: I added a green pepper and onion to the chicken like the Chinese restraunt always does, plus more veggies is healthier! This is amazing! It literally tastes like the unhealthy version from a Chinese food place! I can’t wait to make it again an again and again!!! I saw this recipe two days ago and I was obsessing about it! I made the chicken yesterday and the fried rice today….both came out so good!!!! Even my picky husband and son who don’t really love sweet n sour asked for seconds!!! It is definitely craveable! I saw the comment about soaking the chicken in baking soda/water first so I did that and the chicken was really tender! Sauce was delicious!!! thanks for two great recipes!!!!! I finally decided to try this dish. All I can say is “Wow”. This was surprisingly delicious! My entire family loved it. (I substituted white rice for the fried rice). I made this exactly as the recipe stated and it was amazing! My entire family loved it and then the grandchildren came over and those picky eaters also loved it! LOL Will be making this one over and over!! This is such a great dish!! I’ve made it and so have all of my friends! Thank you for letting us all post & re-post this on Pinterest! And most of all, thank you for sharing it with us!! This looks amazing and delicious. But i must confess, Im a dipper. I was wondering if you think the chicken would still cook the same in the oven if i dont put the sauce on it. In our house we all dip our food into different things (usually, i use what goes with the meal, and the kids insist on ranch, UCK) But do you think that will affect the outcome if i dont cook it with the sauce? Or will the sauce be different? I know i will have to heat it up. Just wondering! Thanks for any input! Is the chicken skinless or skin on? This was the best meal that I have ever made, hands down. I am not that great of a cook but following your recipe was easy and my family ate it up. Suggested this page to friends and they love it, too! Thank you!! My family loves Chinese food and this hit the spot! I’m adding it to our meal rotation. The only change I made was to add pieces of broccoli and use teriyaki sauce in place of the soy in the fried rice. Thanks for posting! I absolutely love this recipe but I was wondering if I could substitute the canola with another type of oil. Do you have any suggestions? Anyone have any ideas for making this without the eggs? This sounds soooo goood, but me and two of my kids are allergic to eggs… ? Thanks! I just made this an although it smells delicious and looks great and we are about to eat it I think next time I’d half the soy sauce. I just tasted it and 1/4 cup is a little more than I’d prefer. It seems to take away all the taste and is overpowering. Next time I’ll try 1/8 cup. Still smells and looks delicious though. I made this a couple weeks ago and my boyfriend and his brother loved this. I’m about to make this again tonight and can’t wait to eat it.Most Chinese places around here are buffet restaurants and they don’t really like to go to buffets so this is really convenient I’m glad i found this. I made this last night for dinner, WOW! I will never need to eat this in a restaurant ever again! I am going to use the left over chicken on salads for dinner tomorrow night! I did my own rice but the chicken recipe in AWESOME thank you for sharing! Oh my gosh…SO GOOD. I doubled the sauce (because that’s how we roll) and it turned out spectacular. Served it over jasmine rice (I didn’t have the ingredients for the fried rice). YUM YUM YUM!!! Amazing! I made this for the second time in a week! Tonight we had my parents and brother over for dinner and I made it for them. They all LOVED it! I even sent them a link to your blog with the recipe. Husband, children, parent, and sibling approved, what can I say? This will be a family favorite for a long time. I used chicken thighs (very well cleaned of fat) the second time around and it came out just as good. I also used brown rice for the the fried rice and subbed frozen corn and fresh chopped carrots for the frozen peas and carrots due to my son’s legume allergy. I’m so glad I found your blog on Pintrest! I’d like to Pin this to Pinterest. Is that an option? One of my FB March 2011 Monkeys mommy group posted this recipe the other day so I decided to try it out last night. OH MY GOD WAS IT DEEEEEELICIOUS!!!! Seriously, my hubby thought I ordered Chinese! Can’t wait to make it again! Sooooo good! My family and I loved it! I did add a TBS of Thai sweet chili sauce to add a bit of spice. It was yummy! Made this for the first time tonite! Even though I was distracted by a phone call for the entire time I was preparing it….it was fantastic!!! Am thinking next time I just might add some pineapple to it!!! So I made this last night for dinner. I used Rice Vinegar instead of distilled vinegar. Let me just say there were NO leftovers!!! I was very surprised on how much flavor it had. Next time my family wants peppers, onion and some pineapple baked with the chicken.. THIS IS A MUST HAVE RECIPE!!! The fried rice looks yummy, I was looking at your ingredients for the rice and I noticed Kikkoman soy sauce, it has wheat in it, LaChoy does not. Thought I mention it. I know this review is one in a million but I just made this and hubs and I both LOVED. It was delicious. Hubs kept saying it was awesome throughout the entire meal. Thanks a ton, this is a keeper for sure. Looking forward to checking out the rest of your recipes! This dish is amazing. My (picky) husband and I enjoy it regularly. Thank you so much for posting such a delicious and simple recipe! I made this a few weeks ago, and it was a huge success! I would like to try it using shrimp tonight…I planned to do the same process for cooking, but turn the oven us to 400 and cook for 15 minutes… Any other suggestions? I want to make sure the sauce thickens up enough, and just worry that 15 min, even at 400, will not be enough time for the sauce, but will dry out the shrimp too much? I’ve made this recipe several times and we love it! I’d like to make it for a large group of friend next week and I’m wondering about frying the chicken a few days ahead of time. That way I can save some time the day of and only have to put the sauce on and bake it. Do you think it’ll dry out? I made this tonight. You were right about shaking the chicken in a bag with the corn starch. Worked well. I cut the recipe in half since there are only to of us. We still had two helpings each. The sesame oil in the rice made it. We will be having this dish again and again!! Thank you for your post!! this was so good…and just as good the next day when i took it to work for leftovers. my friend said “i didn’t know you knew how to cook fried rice?” and i told her with pinterest you can cook anything. she took a bite and practically fell over herself getting a second bite! the rice was awesome and super easy to make and the chicken was good just a little bit time consuming with the cornstarch and egg process, but was worth the wait! thanks a bamillion for posting this recipe! it definitely rivals takeout. Made this tonight, saw on Pinterest. A bit sweet, but delish, used fresh minced garlic in sauce…used half cornstarch and half Wondra flour. Added chopped fresh baby carrots and fresh snow pea pods plus red bell pepper instead of frozen veggies. At the very end, added fresh chives and parsley from garden…yummm. Loved it all. Thanks. Made enough to be sure to have leftovers for lunch. Made this for my family a bunch of times…everyone loves it!! Featured it today on my blog…thanx for sharing this awesome recipe!! Made this last night and not a SINGLE one of my 7 kids complained except for that I didn’t make enough!!! We will def be making this again! Soooo yummy! Thank you for this amazing recipe! Everyone loved it, even my father who is hard to please. WOW, just made this for dinner and it was amazingly tasty!! 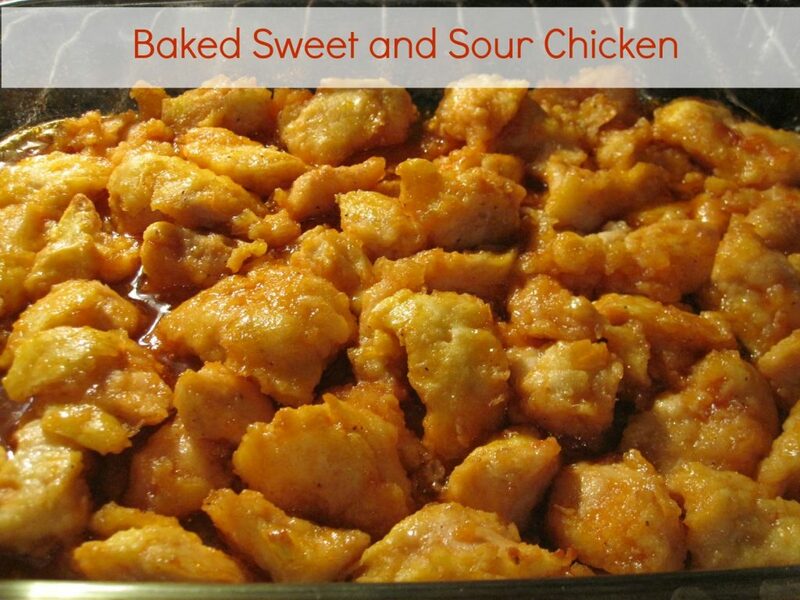 Funny story, my friend was telling me that she found this awesome “baked sweet and sour chicken online” and I said “I did too!” Then we found out we were talking about the same blog —- yours!! Oh my gosh, this is delicious. When I’m having a busy night, I cheat and buy the frozen fried rice and bake it with the chicken. This is another permanent recipe in my list of approved recipes. Thank you! This was fantastic and so worth the little bit of extra effort. It was really, really delicious. Even my husband, who I call a food snob, loved it. The only change I made (and not on purpose) was to use some basmati rice along with a cup of white minute rice. I forgot to check how much rice I had before I started cooking, so I mixed what I had on hand. It came out scrumptious…so it was a good problem to have. Thanks! This is an amazing recipe. I’ve made it with both chicken and pork but it does have quite a bit calorie wise since it’s pan fried. Try cooking the sauce in a sauce pan and basting grilled chicken or pork! I think it tastes even better with the grill taste. Just be careful because it will burn easily. This was amazing!! My family even asked me to cook it again the very next day, so today was our second night of eating the fried rice and sweet and sour chicken!! Delicious!!!!!! This was delicious! I made it for my husband and my son and his family (includes 2 kids ages 3 1/2 and 1 1/2. We all loved it! I also made the fried rice to go with it. Will definitely make this again and again. Thank you! Love, love, love this recipe! Always a hit, especially with kiddos. Thanks for posting this! Everything (the kitchen, me) is an absolute MESS now…but I can’t day enough thanks, because I already know it will all be SO worth it!! = ) My friend pinned this on her Pinterest page. My family has been making it at least once a month since I discovered it. Always a huge treat for us!! Pretty labor intensive, but well worth every bit of effort!! The chicken is amazing!!!! It’s a keeper for sure! The only thing i would change on the fried rice, is lower the soy sauce amount, mine turned out too dark and not as pretty in color as the one here. My wife does something similar with a home made fried rice, for some reason though we’ve never put in peas! It seems silly after seeing the pictures now though. Anyway, that looks really, really good. I really want to make this tonight! I’m salivating! Holly can I sub the sesame oil with anything else, or should I make it just without? Thank you! I want to freeze this recipe. Have you tried this at all? how would you suggest to do it? Tried this for supper tonight, it was delicious! There was none left! Thank you for sharing this recipe – it was fabulous! I love that we just had Chinese for dinner without forking over extra money for it, and knowing full well what was in it! Great recipe. Sometimes I also cook this at home. I put vegetables in rice. Thank you so much for this AMAZING recipe! I pinned this awhile back and just made it tonight. It is definitely going in the rotation! I made this tonight and it was a hit! There were zero leftovers, but I wish there were so I could have some for lunch tomorrow. SO good! Going in the rotation. I have made this several times and it turns out great everytime. I have used less sugar sometimes. I made it tonight with cooked shrimp, just skipped the oven part, cooked down the sauce and then added it to the crispy shrimp. Cut down the time quite a bit. I always make it with the fried rice and I have used all kinds of rice, it always turns out yummy. This is a perfect recipe! My friends and I love it! I can’t stress it enough…..THIS IS ABSOLUTELY DELICIOUS!!! Tasted even better than my favorite Chinese restaurant! I was out of sugar, so I used Splenda and it worked perfectly. The fried rice is perfect! This recipe is so amazing! I have made it a few times now and my family and friends all loved it. I just wish it was a little healthier, its a lot of sugar for one meal. But the great thing is there are a lot of possibilities for substitutions in this recipe. Hello Holly, I came across your blog about a year ago and I have made a number of dishes from your blog that were all very good. I come back often and look through your blog for inspiration. I must tell you that this fried rice is nothing short of amazing. It is probably my husbands and my favorite thing that we make at home. We can not find a restaurant in Sarasota, Fl where we live that serves fried rice that can compare. Thank you so much for the awesome recipe. This was SO SO good!!!! I made the chicken and rice last night and my husband loved it! I grilled the chicken and then put the sauce on it and baked/broiled it to get the sauce nice and thick. It was great and I will definitely be making again, thanks! Delicious! Have made it several times, its a family favorite. But the recipe says cornstarch and then egg, is that right? I have always done it egg then cornstarch, because it seemed the way to do it. I found this recipe over the summer and have made it at least 4 times now.. It tastes just like the unhealthy stuff you get from chinese restaurants but it’s so much healthier because you can control what goes in it! Today, I went to make this dish and realized: I’M OUT OF CORNSTARCH. I opted to sub part flour and part corn meal in its place, but to make it a hint healthier, I finely ground up some old fashioned oats to make oat flour. I used 1 cup oat flour and a handful of cornmeal. It came out wonderfully and I actually prefer it this way than with the cornstarch! I decrease the sugar to ~1/4 – 1/2 c brown sugar and 1/8-1/4 cup raw cane sugar (though I’d like to use stevia sometime.. just didn’t have it on hand). I also use 1/2 apple cider vinegar and 1/2 white vinegar–the natural sweetness of the ACV makes up for the decrease in sugar without compromising the taste! I add freshly minced garlic, a few dashes of toasted sesame seeds, a some crushed red pepper flakes for a spicy kick. Today, I splashed a bit of my red wine in the sauce too and it was DELICIOUS! The recipe is AMAZING and so simple! It’s delicious the way it is–you can’t mess it up! But if you wanted to play around with it to suite your own tastes, it’s a great recipe to experiment with! Lady, you are a cooking goddess for sharing this recipe. I’m 15 years old and I told my stepmother about this, and she was skeptical, but we just finished and ate. IT WAS THE MOST AMAZING THING IVE EVER EATEN. chicken-wise, anyway. Thank you so much for this. God bless. I am using cut up chicken breast tenders for the sweet and sour chicken recipe and was wondering how many ounces are the chicken breasts you normally use? I have 2lbs of chicken tenders and want to make sure I have enough sauce for it all. Thanks! BTW I have made this before but it’s been awhile and I used chicken breasts the first time. Can’t remember the size though. :/ Anyway, I am not a sweet and sour chicken fan but this recipe is amazing!!!! Thanks for sharing! I made this a couple of weeks ago. It was so delicious. My daughter is an extremely picky eater and she loved this so much, she took leftovers to work the next day. Thank you! It’s going in my recipe file. I SAW YOUR RECIPE FOR THE SWEET AND SOUR CHICKEN AND IT LOOKED DELICIOUS AND NOT VERY TIME CONSUMING. SO I MADE IT THIS EVENING FOR MY FAMILY AND THEY LOVED IT!!!! I ALSO MADE THE FRIED RICE AND THEY SAID THAT IT TASTE BETTER THEN THE PLACE WE ORDER CHINESE FROM… THANK YOU FOR SHARING…I HAVE PUT IT IN MY RECIPE LOG….. I made this for the second time the other night when we had company. There were no leftovers for the 6 of us and my kids couldn’t stop eating it. I am thankful my oldest son helped me bread the chicken to make that go faster. I highlighted it in my Small Victories Sunday linky where I feature the books I read, recipes I cooked and other small victories being a mom of 3. I hope you will stop by my linky and share another great recipe (or two or three!) with me and my readers. I look forward to trying out more from your site! I’m a huge fan of all of your recipes! My husband said tonight that the sweet and sour chicken was 100 times better than he imagined! My son ate 2 huge portions of the fried rice! Thanks for sharing! oh my goodness.. this is AMAZING!! Our favorite restaurant is PF Changs, but we currently live on Guam and there is not a great chinese option.. I swear this is BETTER than PF Changs! 🙂 Thank you!! Definitely a new favorite in our house!! I made this for my family tonight. They love it. I made a gluten free version of this tonight. We loved it! My husband said it was one of his favorite gfree dishes yet!! And he’s been gfree for 7 years! This was delicious…thanks. P.S. Has anyone tried beef? If so, does the cooking time stay the same, and what cut of beef? I made this for dinner tonight. It was SO good. The next time I make it, and I’m thinking it will be in the rotation from now on, I will have to double the recipe. I made it for myself and the kids when my husband was at work, and honestly, it was hard for me to make sure there was any left for him to try! hi! im making this tonight! if I don’t have cornstarch at home can I use flour instead? if so how much? thank you!! made this last night, my husband loved it. gona make this again. it’s a keeper. One of my fav meals! It gets a little messy…. Not a quick meal deal. Oh my, it is so worth it though! Thanks so much! I made the sweet and sour chicken for the first time ever tonight, and it turned out AMAZING. It was super easy to put together, and I would definitely make it again. What would I do if I wanted to use my crock pot for the chicken part?? Made this for dinner tonight and it was delish!! My husband said it was one of the best sweet and sour chicken he’s had! Will definitely be making this again! I have made the baked sweet and sour chicken on many occasions! I am in looooove!! I have cheated and added pre-breaded/already cooked popcorn chicken chunks and just pour the sauce over them and bake them in the oven until tender and saucy. Thank You so much for this!! This recipe is sooooooo good…I am making it tonight for dinner, the second time I’ve made it and I can’t wait to eat it!!! My kids love it too!! This was SO delicious! Seriously tasted like takeout. Thanks for the great, easy recipe. This is the best recipe I’ve ever found on the internet and I make it often. Love it–thank you! Fantastic! My husband who doesn’t usually eat sweet and sour loved it, and the fried rice was even more of a hit. Will be making this again and again. This is fantastic, I make it often for my family!!! This meal here was awesome . I would definitely recommend to all. This is not a 15 min meal, but at the end of the day you will get high quality restaurant taste. Love it! I’ve made it a couple of times. Delicioso! This is a no fail “LOVE IT” meal for my family and I. And it’s gluten-free (if you use gluten-free soy sauce). I can’t say enough about how yummy it is. This is a family favoirte. Anytime i ask for suggestions this is what is suggested. i have even made it with pork and it is really yummy also. The baked chicken was amazing, i used cider vinegar cuz i had it and still great. i just wish i could figure out how to make this more weight watchers point friendly. Fabulous! My husband said it immediately goes into our top 5 meals rotation. We sauteed some onions and yellow bell peppers to have along with it, and I agree you could get away with using 1/2 c of corn starch. Thank you once again for an amazingly delicious recipe! I just made this tonight and it was delicious! Thanks for sharing the recipe. I will be adding this to the rotation because my family loves Chinese. This was absolutely fabulous. My boys (my teenaged son and his dad) went crazy over it. I served it up with fried rice and egg rolls and they chowed it down. This one is definitely a keeper, thanks so much! This is so good! It works really well to make ahead and do the frying, mix the sauce then pour over when you want to cook. Can even do the day before so everything is quick and easy for dinner. This is delicious!! I made it for the second time today and it’s such a hit! Paired with the rice, it’s simply the perfect combination. Thanks so much!! Do you know if this can be frozen? I’m looking for freezer meals for my son and daughter-in-law to have after the baby comes. Looks delicious! I made a triple batch today…one of which will be frozen in a freezer baggie with the sauce in a separate baggie. I will thaw both bags before throwing the sauce on the chicken and tossing in the oven. I think it will be fine. If you freeze it with the sauce on it its’ going to be one big frozen log. May burn the bottom before it fully thaws/cooks. I made this tonight. It was GREAT!! We all loved it. I made 4 small breasts and we could have used more for sure. I made this tonight. It was fabulous! This was super yummy! Boyfriend gave me 2 thumbs up! will definitely safe this recipe!!! You;re awesome. Have you ever made this rice with shrimp? I would like to know how you would cook your shrimp with this.. like shrimp friend rice. I hate garlic do I have to add garlic? This is my FAVORITE EVER recipe. As in …history of the internet or cookbooks. I have made it probably a dozen times. It IS time consuming but it is SOOOOO good! I also like that it is very forgiving. You can pretty much add and subtract ingrediants with a good result. I always add waterchestnuts to my rice and cut the soy sauce and have used brown sugar instead of white because that’s all I had…always delicious! I very rarely leave comments on sites; It’s hard to say something that hasn’t been said before! But I’ve been making this recipe for friends and family for almost two years now and it’s always a hit. Even the picky neighbourhood kids will eat it when they come for dinner, and I usually have to increase it! My SIL is Celiac, and this is something we can all enjoy! So…. thank you, thank you, thank you so much for such a simple and easy recipe! This is a delicious recipe and quickly became a family favorite! We did add a few things to make it our own (pineapple chunks-drained, and 1 red bell pepper). Thank you for a new fun dinner for the whole family! Hi Holly! 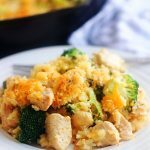 This is one of my favorite, most easy go to meals but I was wondering if you’ve ever tried doing it in the crockpot (just the chicken)? How many pounds of chicken did you use? I’ve made it a few times and it is my husband’s and my favorite meal! I was just wondering about the lbs because I like to make this in big batches so I need to know how much sauce to make. I know this is an older recipe, but my kids love this and requested all the time. It’s a little labor-intensive but definitely worth it. Thanks for the recipe! reading it, you are a great author.I will make certain to bookmark your blog and will often come back sometime soon. I’ve made this a bunch of times and it is DELICIOUS!!!! It does take some work, but so worth it. We are never disappointed eating this and by some rare miracle there are leftovers we fight for them!! My kids love this recipe SO much, they both ask for it on their birthdays! It’s so easy and so good. Just a little time consuming. But I’m perfecting that we make it so much! This recipe is my spirit animal. Seriously this is the best!!!! And I’m not an experienced cook at all but this tasted exactly like takeout but you dont have to question what kind of meat it really is… lol A++++++!! And I shared it with all my friends! Great Recipe! Tonite I tried it with pork! I used a meat thermometer, and I didn’t need to cook it for the full hour, but it still turned out yummy! Thanks for sharing! Made this Saturday and it was so good! Boyfriend approved too. Thanks! This is delicious! I cut the sugar to 1/2 cup and it was sweet enough for us. The fried rice had a strong onion flavor so I obviously did not use a small enough onion. I had some more rice to cut down the strong onion flavor and that helped.